The variety of hiking opportunities in the vicinity of Lake Louise and Moraine Lake is surely equal to any area on the face of the earth. The region’s potential for outdoor recreation was first realized in the late 1800s, and it soon became the center of hiking activity in the Canadian Rockies. This popularity continues today; trails here are among the most heavily used in the park. Hiking is best early or late in the short summer season. Head out early in the morning to miss the strollers, high heels, dogs, and bear bells that you’ll surely encounter during the busiest periods. 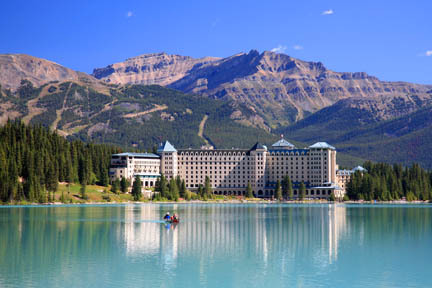 The two main trailheads are at Fairmont Chateau Lake Louise and Moraine Lake. Two trails lead from the village to the chateau (a pleasant alternative to driving the steep and busy Lake Louise Drive). Shortest is the 2.7-kilometer/1.7-mile Louise Creek Trail. 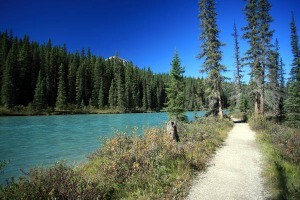 It begins on the downstream side of the point where Lake Louise Drive crosses the Bow River, crosses Louise Creek three times, and ends at the Lake Louise parking lot. The other trail, Tramline, is 4.5 kilometers (2.8 miles) longer but not as steep. It begins behind the railway station and follows the route of a narrow-gauge railway that once transported guests from the CPR line to Chateau Lake Louise. This loop follows both banks of the Bow River southeast from the railway station. Used by joggers and cyclists to access various points in the village, the trail also links the station to the Lake Louise Alpine Centre, Post Hotel, Samson Mall, both campgrounds, and the Louise Creek and Tramline trails to Lake Louise. Interpretive signs along its length provide information on the Bow River ecosystem. 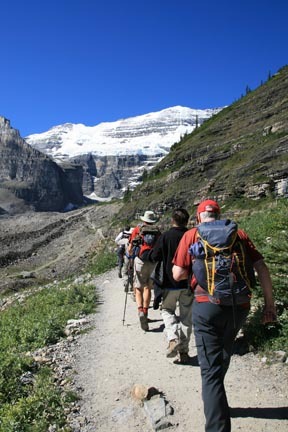 Hikers along this trail are rewarded not only with panoramic views of the glaciated peaks of the main range, but also with a rustic trail’s-end Plain of the Six Glaciers Teahouse serving homemade goodies baked on a wooden stove. For the first two kilometers (1.2 miles), the trail follows Louise Lakeshore Trail to the western end of the lake. From there it begins a steady climb through a forest of spruce and subalpine fir. It enters an open area where an avalanche has come tumbling down (now a colorful carpet of wildflowers), then passes through a forested area into a vast wasteland of moraines produced by the advance and retreat of Victoria Glacier. Views of surrounding peaks continue to improve until the trail enters a stunted forest. After switchbacking up through this forest, the trail arrives at the teahouse. Built by the CPR at the turn of the 20th century, the teahouse operates the same way now as it did then. Supplies are packed in by horse, and all cooking is done in a rustic kitchen. It’s open July through early September. After resting, continue one kilometer (0.6 mile) to the end of the trail on the narrow top of a lateral moraine. From here the trail’s namesakes are visible. From left to right the glaciers are Aberdeen, Upper Lefroy, Lower Lefroy, Upper Victoria, Lower Victoria, and Pope’s. Between Mount Lefroy (3,441 meters/11,290 feet) and Mount Victoria (3,459 meters/11,350 feet) is Abbot Pass, where it’s possible to make out Abbot Hut on the skyline. When constructed in 1922, this stone structure was the highest building in Canada. The pass and hut are named for Phillip Abbot, who died attempting to climb Mount Lefroy in 1896. This moderately strenuous hike is one of the park’s most popular. It begins in front of the chateau, branching right near the beginning of the Louise Lakeshore Trail. 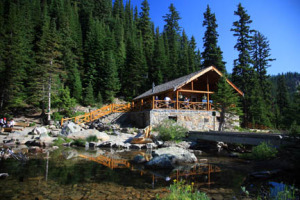 For the first 2.5 kilometers (1.6 miles), the trail climbs steeply, switchbacking through a forest of subalpine fir and Engelmann spruce, crossing a horse trail, passing a lookout, and leveling out at tiny Mirror Lake. Here the old, traditional trail veers right (use it if the ground is wet or snowy), while a more direct route veers left to the Plain of the Six Glaciers. The final elevation gain along both trails is made easier by a flight of steps beside Bridal Veil Falls. The trail ends beside Lake Agnes Teahouse, which overlooks Lake Agnes, a subalpine lake nestled in a hanging valley. The teahouse offers homemade soups, healthy sandwiches, and a wide assortment of teas. From the teahouse a one-kilometer (0.6-mile) trail leads to Little Beehive and impressive views of the Bow Valley. Another trail leads around the northern shore of Lake Agnes, climbing to Big Beehive or joining to the Plain of the Six Glaciers Trail, just 3.2 kilometers (two miles) from the chateau and 2.1 kilometers (1.3 miles) from the teahouse at the end of that trail. The lookout atop the larger of the two “beehives” is one of the best places to admire the uniquely colored waters of Lake Louise, more than 500 meters (1,640 feet) directly below. The various trails to the summit have one thing in common–all are steep. But the rewards are worth every drop of sweat along the way. The most popular route follows the Lake Agnes Trail for the first 3.6 kilometers (2.2 miles) to Lake Agnes. From the Lake Agnes Teahouse, a trail leads to the western end of the lake, then switchbacks steeply up an exposed north-facing ridge. At the crest of the ridge, the trail forks. To the right it descends to the Plain of the Six Glaciers Trail; to the left it continues 300 meters (0.2 mile) to a log gazebo. This trail is not well defined, but scrambling through the large boulders is easy. Across Lake Louise is Fairview Mountain (2,745 meters/9,000 feet), and behind this peak is the distinctive shape of Mount Temple (3,549 meters/11,645 feet). Views also extend up the lake to Mount Lefroy and northeast to Lake Louise winter resort. Views from the edge of the cliff are spectacular, but be very careful—it’s a long, long way down. By returning down the Lake Louise side of the Big Beehive, the loop is 11.5 kilometers (7.1 miles). This trail climbs the lower slopes of Fairview Mountain from beside the boathouse on Lake Louise, ending in an alpine meadow with a view of Mount Temple from across Paradise Valley. Four hundred meters (0.2 mile) from the trailhead, the trail forks. Keep left and follow the steep switchbacks through a forest of Englemann spruce and subalpine fir until reaching the flower-filled meadow. The meadow is actually a pass between Fairview Mountain (to the northwest) and Saddle Mountain (to the southeast). Although most hikers are content with the awesome views from the pass and return along the same trail, it is possible to continue to the summit of Fairview (2,745 meters/9,000 feet), a further climb of 400 vertical meters (1,310 vertical feet). The barely discernible, switchbacking trail to the summit begins near a stand of larch trees above the crest of Saddleback. As you would expect, the view from the top is stupendous; Lake Louise is more than one kilometer (0.6 mile) directly below. This option is for strong, experienced hikers only. From the Saddleback, the trail descends into Sheol Valley, then into Paradise Valley. The entire loop would be 15 kilometers (9.3 miles). This aptly named trail makes for a long day hike, but it can be broken up by overnighting at the backcountry campground at the far end of the loop. The trail climbs steadily for the first five kilometers (3.1 miles), crossing Paradise Creek numerous times and passing the junction of a trail that climbs the Sheol Valley to Saddleback. After five kilometers (3.1 miles) the trail divides again, following either side of the valley to form a 13-kilometer (eight-mile) loop. Lake Annette is 700 meters (0.4 mile) along the left fork. It’s a typical subalpine lake in a unique setting–nestled against the near-vertical 1,200-meter (3,940-foot) north face of snow- and ice-capped Mount Temple (3,549 meters/11,645 feet), one of the 10 highest peaks in the Canadian Rockies. This difficult face was successfully climbed in 1966, relatively late for mountaineering firsts. The lake is a worthy destination in itself. Allow yourself four hours round-trip from the trailhead. For those completing the entire loop, continue beyond the lake into an open avalanche area that affords views across Paradise Valley. Look and listen for pikas and marmots among the boulders. The trail then passes through Horseshoe Meadow, crosses Paradise Creek, and heads back down the valley. Keep to the left at all trail crossings, and you’ll quickly arrive at a series of waterfalls known as the Giant Steps. From the base of these falls, it is eight kilometers (five miles) back to the trailhead. 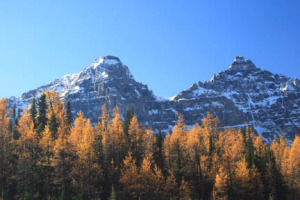 In fall, when the larch trees have turned a magnificent gold and the sun is shining, few spots in the Canadian Rockies can match the beauty of this valley, but don’t expect to find much solitude (and don’t be too disappointed if the trail is closed in fall–it often is because of wildlife). Although the most popular time for visiting the valley is fall, it is a worthy destination all summer, when the open meadows are filled with colorful wildflowers. The trail begins just past Moraine Lake Lodge and climbs fairly steeply, with occasional glimpses of Moraine Lake below. After reaching the junction of the Eiffel Lake Trail, keep right, passing through an open forest of larch and into the meadow beyond. The range of larch is restricted within the park, and this is one of the few areas where they are prolific. Mount Fay (3,235 meters/10,615 feet) is the dominant peak on the skyline, rising above the other mountains that make up the Valley of the Ten Peaks. Keen hikers should consider continuing through the open meadows of Larch Valley to Sentinel Pass (2,608 meters/8,560 feet), one of the park’s highest trail-accessible passes. The length and elevation gain listed are from Moraine Lake. Once in Larch Valley, you’re halfway there and have made over half of the elevation gain. 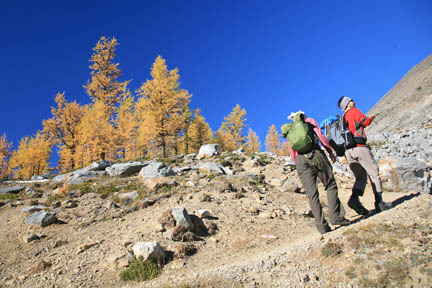 Upon reaching Larch Valley, take the formed trail that winds through the open meadow. After climbing steadily beyond Minnestimma Lakes, the trail switchbacks for 1.2 kilometers (0.7 mile) up a steep scree slope to the pass, sandwiched between Pinnacle Mountain (3,067 meters/10,060 feet) and Mount Temple (3,549 meters/11,645 feet). 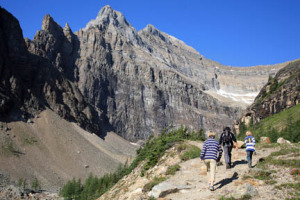 From the pass most hikers opt to return along the same trail, although with advanced planning it is possible to continue into Paradise Valley and back to the Moraine Lake access road, a total of 17 kilometers (10.6 miles) one-way. Eiffel Lake is small, and it looks even smaller in its rugged and desolate setting, surrounded by the famed Valley of the Ten Peaks. 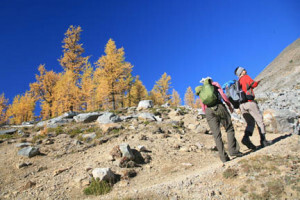 For the first 2.4 kilometers (1.5 miles), follow the Larch Valley Trail, then fork left. Most of the elevation gain has already been made, and the trail remains relatively level before emerging onto an open slope from where each of the 10 peaks can be seen, along with Moraine Lake far below. From left to right the peaks are Fay, Little, Bowlen, Perren, Septa, Allen, Tuzo, Deltaform, Neptuak, and Wenkchemna. The final two peaks are divided by Wenkchemna Pass (2,605 meters/8,550 feet), a further four kilometers (2.5 miles) and 360 vertical meters (1,180 vertical feet) above Eiffel Lake. The lake itself soon comes into view. It lies in a depression formed by a rock slide from Neptuak Mountain. The lake is named for Eiffel Peak (3,085 meters/10,120 feet), a rock pinnacle behind it, which with a little imagination could be compared to the Eiffel Tower in Paris. This short trail begins with a crossing of Moraine Creek at the outlet of Moraine Lake and ends at a pleasant subalpine lake. The first section of the trail traverses a boulder-strewn rock pile–the result of rock slides on the imposing Tower of Babel (3,100 meters/10,170 feet)–before entering a dense forest of Engelmann spruce and subalpine fir and following Babel Creek to the lower lake. The wide valley affords 360-degree views of the surrounding jagged peaks, including Mount Temple back down the valley and Mounts Bident and Quandra at the far end of the lakes. 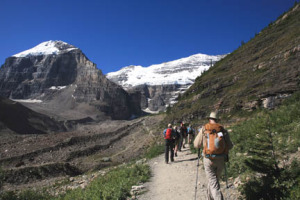 The trail into historic Skoki Lodge (see Lake Louise Hotels) is only one of the endless hiking opportunities tucked behind Lake Louise winter resort, across the valley from all hikes detailed previously. The first four kilometers (2.5 miles) of the trail are along a gravel access road leading to Temple Lodge, part of the Lake Louise winter resort. From here, the trail climbs to Boulder Pass, passing a campground and Halfway Hut, above Corral Creek. The pass harbors a large population of pikas and hoary marmots. The trail then follows the north shore of Ptarmigan Lake before climbing again to Deception Pass, named for its false summit. It then descends into Skoki Valley, passing the Skoki Lakes and eventually reaching Skoki Lodge. Just over one kilometer (0.6 mile) beyond the lodge is a campground, an excellent base for exploring the region.